What Accessories are available for my 100X? What maintenance and spare parts are available for my 100X? What service parts are available for my 100X? What are the Maintenance Requirements for my 100X? How do I prepare the Sodium Chloride Solution for my 100Xs? How do I install the Local Exhaust accessory? How do I set-up and operate my standard model 100Xs/100Xp? How do I switch between Automatic and Manual mode when using the Hybrid model? How do I change Operators? Introduction: The 100Xs Salt Aerosol Automated Filter Tester is designed to meet the sodium chloride testing requirement of NIOSH 42 CFR Part 84. This testing specification requires a NaCl aerosol with a count median diameter (CMD) of 0.075 ± 0.020 µm with a particle distribution having a standard geometric deviation of less than 1.86. The aerosol produced is also subjected to an ionized air stream to shift the electrically charged generated aerosol to a neutral state (Boltzmann Equilibrium) characteristic of naturally occurring aerosols. Aerosol generation in the 100Xs is achieved using an ingenious, patented submerged nozzle nebulizer and regeneration technique. An air jet exiting the nozzle at high speed below the surface of the aerosol liquid generates bubbles that remain suspended within the liquid. When these bubbles reach the surface of the liquid they burst and generate airborne particles containing water and sodium chloride. As the airborne particles rise within the generator cylinder, the water is evaporated from the particle, forming the dry, sodium chloride aerosol necessary to perform efficiency testing. 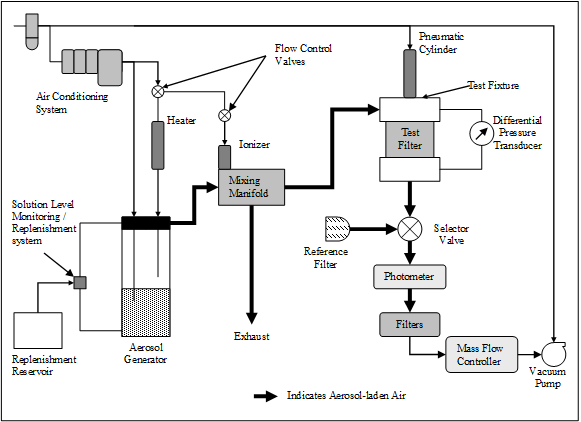 Aerosol generation occurs at a level exceeding the maximum test flow capabilities of the 100Xs. The purpose of this excess aerosol is to maintain constant levels of aerosol regardless of the sample rate. Excess aerosol is exhausted from the 100Xs and captured either by a user supplied exhaust or an ATI Local Exhaust Module, if installed. The forward light scattering photometer is designed based on MIE scattering theory for analyzing particles dispersed in a fluid. This design includes a cylindrical housing enclosing a pair of axially spaced, spherical-surfaced, bi-convex lenses which provide axial focusing of the lamp image in an intermediate light scattering chamber through which the aerosol sample being analyzed is passed.